Uchû Kyôdai (2012) - Sci-fi-central.com. Japan  2012  129m   Directed by: Yoshitaka Mori. 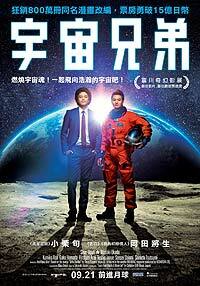  Starring: Shun Oguri, Buzz Aldrin, Masaki Okada, Richard E. Wilson, Hirofumi Arai, Shin'ichi Tsutsumi, Gregory Pekar, Kumiko Asô, Mitsuru Fukikoshi, Mike Guzman, Nickolas Wolf, Melissa Goggans, Gaku Hamada.  Music by: Takayuki Hattori. Space Brothers surprised me positively. It's thrilling as a space movie should be, the story is better than similar movies, and the acting is pretty good. It begins with two kids finding a hobby they love and explores where a dream or lack of it can take people to. Shun Oguri is great as the older brother. It's fun to watch him change gears between childish, thoughtful, miserable, and satisfied. He's surprisingly good at portraying a wide range of emotions in a single character and shines in a couple of dramatic scenes. There's this shampoo scene of his character that made me seriously laugh, which was a first for me in a space movie. Masaka Okada plays the younger brother and thankfully, he pulled off this one critical moment in the movie: If the most dramatic space moment in a space movie is bland, then that movie is over for me! This wasn't the case. Space Brothers has a slightly different pace and sense than similar movies and I liked that. It has small faults but the brothers theme worked well and it's a good watch! Review by baharuka from the Internet Movie Database. [Review] Space Brothers -'live action.